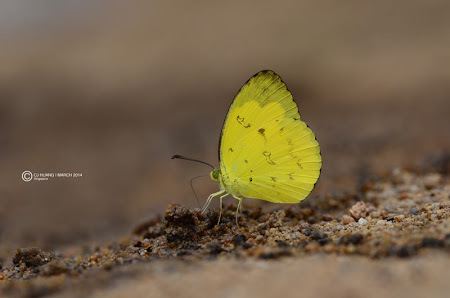 Many of the Grass Yellows' males puddle at damp roadside paths and banks of forest streams for nutrients. The puddling butterfly presents the best opportunity for a photographer to sneak up on it and take a good shot of the butterfly. When it is flying erratically it is almost futile to chase the butterfly to try to photograph it. Beautiful picture. I really love Eurema. We don't have any yellow butterflies in Scotland and no Pieridae so small. I have only been to two places where Eurema live and it was a real thrill for me to see them.